The Fringe model has been completely redesigned, rocker, foam flow, rails, outline and construction. A full vee bottom with double concave creates an effortless glide with a smooth rail to rail turning. Drivey when you need it more pivot when you push. A quick paddler and very stable ride. Rockers offer a nice smooth entry with subtle slow smooth constant curve between the stance and a bit of tail release to allow the board to finish the turns. This along with the vee makes for a quick rail to rail snappy responsive ride. An easy to ride round pin tail fun board offering great stability and smooth paddling. The smaller Fringe sizes are fun and easy with fishier outlines. These boards are all about getting the maximum out of small or not so powerful wave sessions. A fuller outline for ease of paddling and catching waves, and a narrower tail allow for quick accelerating turns. As the line evolves it moves into fuller and wider outlines on the bigger sizes. These are all about getting your first shorter board that is forgiving enough to perform yet performance enough to push your surfing. 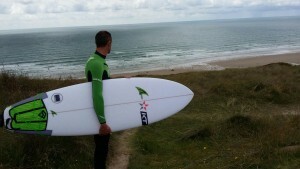 It’s a great all around board for learning and progressing your surfing. The Fringe is as at home in punchy waves, clean point breaks or mushy beach break. Available in 5’6″, 5’8″, 5’10”, 6’0″, 6’2″, 6’4″, 6’8″, 7’0″, 7’6″, 8’0″. Available in white, blue logos, blue finboxes. In a nutshell : Great wave catchability , Go fast in small waves, possibility to perform some more intermediate and advanced maneuvers in gutless waves, catch mushier smaller waves that may normally pass you by.